KSRealityBites: 2011 High Level meet on AIDS! 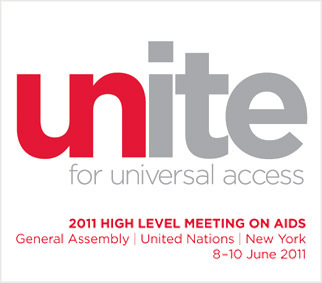 2011 High Level meet on AIDS! NEW YORK: More than 3,000 people came together at the United Nations for the UN General Assembly high level meeting on AIDS that began here on 8th June. The meeting, which will conclude till 10th June, will provide an opportunity to take stock of the progress & challenges of the last 30 years & shape the future AIDS response, the statement said. 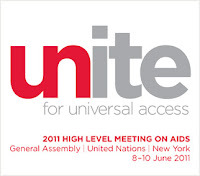 "The high level meeting on AIDS is taking place 10 years after the historic 2001 United Nations Special Session on HIV/AIDS, & the 2006 signing of the Political Declaration where UN member states committed to moving towards universal access to HIV prevention, treatment, care & support," the statement added. "More than 30 heads of state, government & vice presidents will attend the meeting which will include official plenary & five panel sessions along with 40 individual side events. On the final day, UN member states are expected to adopt a declaration which will guide country responses to HIV over the next five years," it added. Twenty-two countries 've achieved universal access to services which prevent mother-to-child transmission of HIV, the statement said. The rate of new HIV infections has decreased by 25% in the last 10 years, deaths have reduced by 20% in the last five years & 6.6 million people are now accessing antiretroviral therapy, compared to just a few thousand in 2001, it added. Progress has also been made in breaking down barriers to stigma & discrimination & in removing punitive laws such as travel restrictions for people living with HIV, it said. "Inequity, discrimination & laws against people living with or at risk of HIV continue to block access to HIV services for people most in need. We need a response to HIV that is grounded in human rights & one which promotes equality & equity. Achieving this will open the way to a world free from HIV," said Michael Sidibe, executive director of the Joint United Nations Programme on HIV/AIDS (UNAIDS).